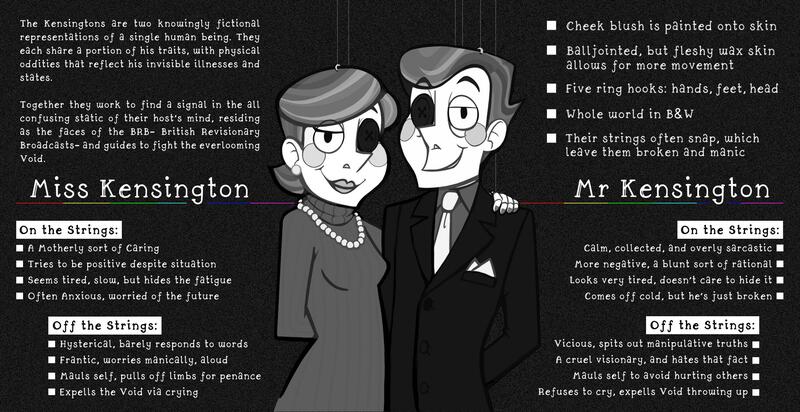 Miss Kensington is one exaggerated split of her host's- Alistar's- personality, and exists as both an online persona, and a guide to his mental realm. Miss K has been with Alistar since childhood, despite him not knowing it; in non-human personas, in wishes of a better life, in the times he needed someone the most. 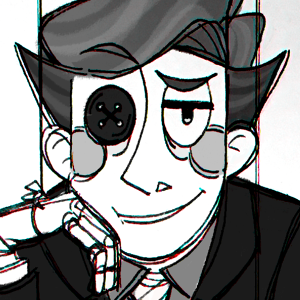 In an attempt to remind himself of his qualities- both good and bad- he anthropomorphized his goals, self, illness, and a past disassociate persona into one neat little package. Out of it formed Miss Kensington, the 'expectation' vs Alistar's reality: the on-air face. 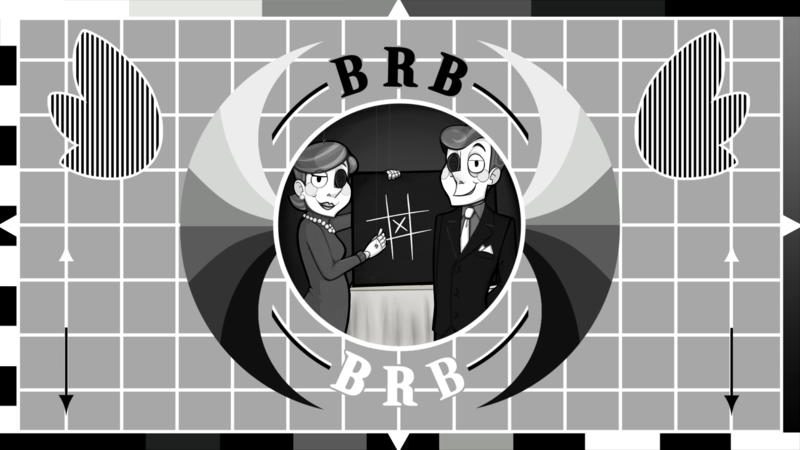 The first Marionette was only meant to be a fun face of Alistar's online branding, but as time went on, the BRB slowly unfolded into something far greater than he could imagine: a way to find himself. Miss Kensington became a guide to her vessel, and through her he was able to explain how he felt to passers-by. Then soon after, Mr Kensington was pulled from the Void, and it was realized that Miss Kensington was only one half of a whole. 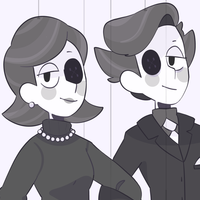 Both Marionettes share thier vessel's illness', including constant, varying levels of pain, brain fog episodes, fatigue, and memory issues. This can lead to moments of silence and coping, or the annoyance of forgetting; although a negative part, it is a core part of their being. 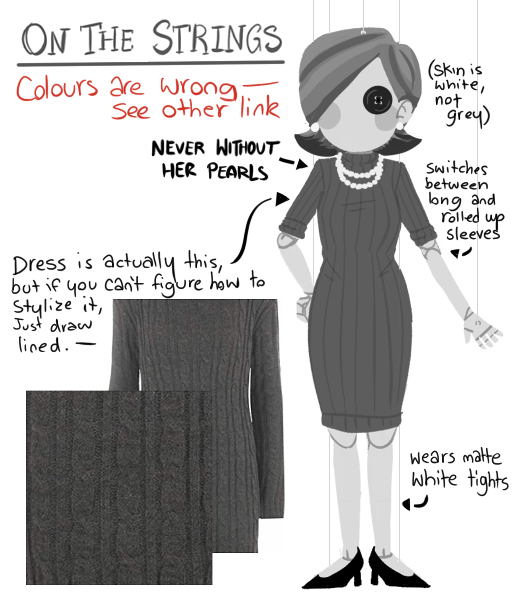 Her 'On the Strings' Outfit and Colour Guide. She is literally black-and-white, and has no pigment of colour. The two circle-cheeks are permanently painted onto her skin (not a style choice, like a lot of people assume). She's ball-jointed, like a doll. However her skin is still a flesh-like substance, and can move more humanly. These are also detachable, and will often fall off under strain. 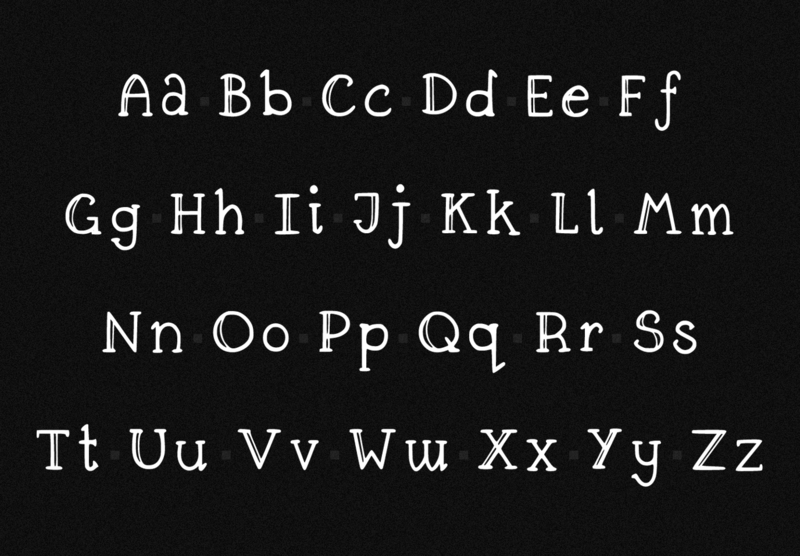 The Kensingtons font is always written in serif- This to be exact. If you're going to write their speech in any art, please at least use serif. The Kensingtons are living Marionettes, but that wasn't always the truth. Once something akin to human, their metaphysical bodies- where-ever they were at the time- began to splinter under the mental and bodily strain of chronic illness. As the pain grew, their joints began to shift, and mobility became a problem; The vessel's mind had started violently shutting down, and with this, the Void began to swallow them- and Alistar- whole. Alistar was diagnosed with Fibromyalgia and Chronic Fatigue Syndrome- as well as depression- not long after, and swiftly began medication. 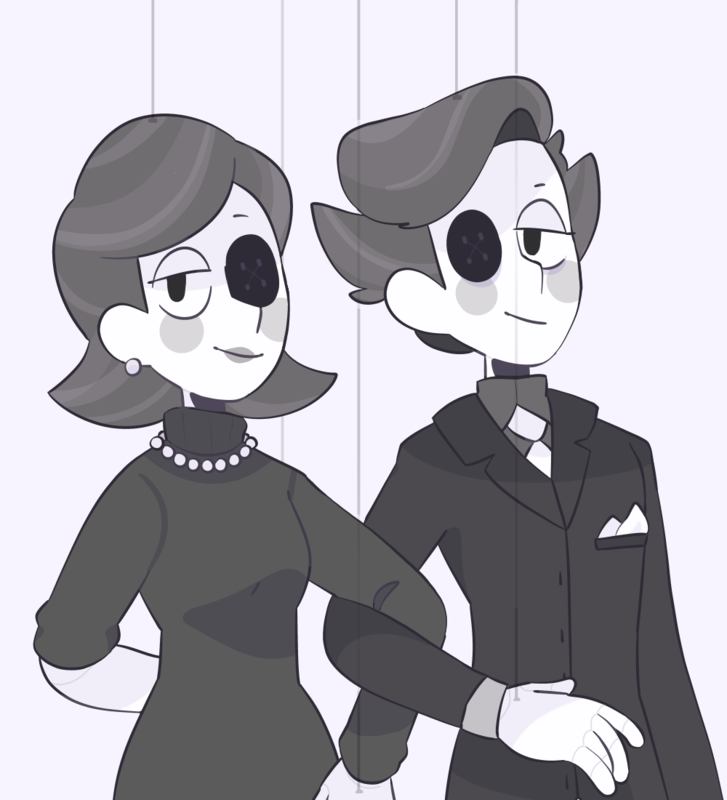 As he began to work on his predicament, the Marionettes were given their aid: reaching from the Static above, strings fell to take the weight off both physically and mentally, and they were settled into the newly-formed British Revisionary Broadcasting studio. But inevitably, strings under heavy weight will always snap, and the Kensingtons will fall alongside their vessel. 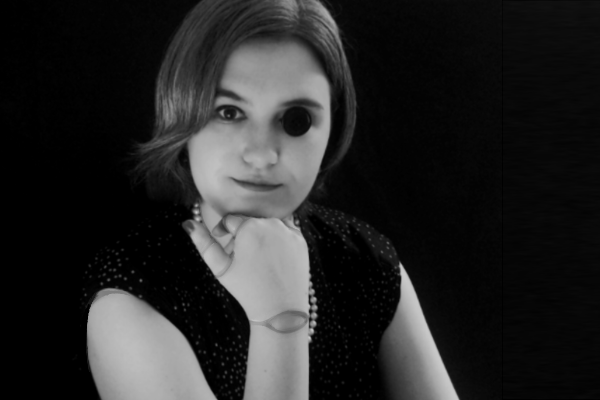 When On her strings, Miss Kensington seems like a fairly stable woman, and there's a motherly air about her, like she'll get you a cup of tea and listen to you talk for hours. She's quite a positive person, and other people- and their happiness- mean the world to her! But with that, there's an anxiety that can eat at her thoughts: Is that person having fun? Am I speaking too much? Gosh, they could be with someone better... She'll try and hide it though, as she has her whole existence. Politeness is key, after-all, and god she hates being shouted at. Although she thinks logically, she'll often rely more on her feelings than her thoughts. If something's going badly, she'll attempt to fight it with positivity and rational ideas. If it fails though, she gets very worked up and hard on herself. She takes things said to her with utmost importance, and one negative opinion can stay on her mind for weeks; because of this, the Void can get to her even when it's not in the vicinity. As the strings struggle with their burden, the Void will take its chance. The Void is always following, you see, and if you slow down it will only catch up. In her case, it lies about others, it tells her what she's paranoid about: 'Nobody likes you, it's just pity', 'You talk so much about yourself, but you pretend it's 'relating', 'I will own you until the end of time'. And this time- despite experience- she listens. When Off her strings, Miss Kensington is a frantic mess. She uses her limited energy to grasp at her body, lightly rocking as she rips her hair out. She sits forward in her armchair, sobbing dramatically into her hands, crying and covered in the black sludge of the Void. She speaks to herself aloud, repeating the Void's words as if fact, panic in every syllable. No amount of rationality can get to her like this, and if you try and calm her, she'll simply spit a terrified 'fact' back at you. In her hysterics, she'll usually go too hard on herself, detaching limbs without even realizing. 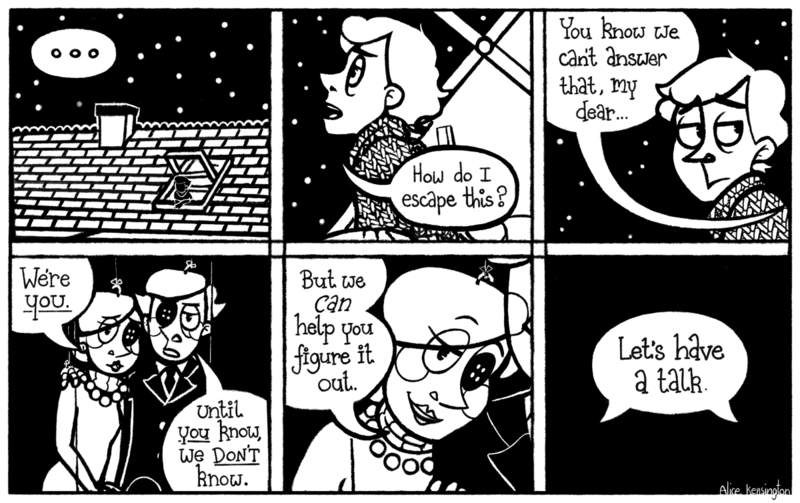 Miss Kensington is utterly terrified of the future, and is convinced she won't survive it. Eventually she'll run out of Void to expell, and fatigue will overwhelm her. She'll sit, staring into the static, murmuring 'truths' before telling herself they weren't real. She always expels the Void before her counterpart, calming herself down as he hurls abuse at her; she knows he doesn't mean it, she's lived his life, she knows it's not him... but it still hurts. Eventually he apologizes, she forgives him, and they'll sit in silence together. As she falls into a deep sleep, William will fix her back up, and life will resume. Her more logical, relaxed, half. He's more rational than she is, but negativity comes with that; where-as she likes to pretend everything will be okay, he'll bluntly correct her. She is the last sliver of hope in an otherwise defeated mind, and he doesn't understand why she does it to herself- beat herself up, when she knows deep down that it'll go wrong. She's sad he can't see that hope makes life easier, but she's happy to be the hope for the both of them. No matter, she's happy he's around now... it was lonely before, and she hadn't seen him in oh so long. There's an understanding love between the two, but they also disagree very often. 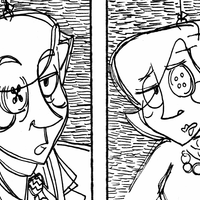 The inner-turmoil of a human being anthropomorphizes itself, and the two will bicker over everything from 'should we tell this person they look nice? ', to 'Do I have to be happy to be alive?'. Eventually they'll find some resolve, make up, and continue on as a happy family. Commission by @MilkeBox on Twitter! The Image from the first of the new Streams. [Off the Strings] The Void: the depression and doubt and words that are not our own. Taking the voice of those who can hurt you most, and hurting you the most with lies.